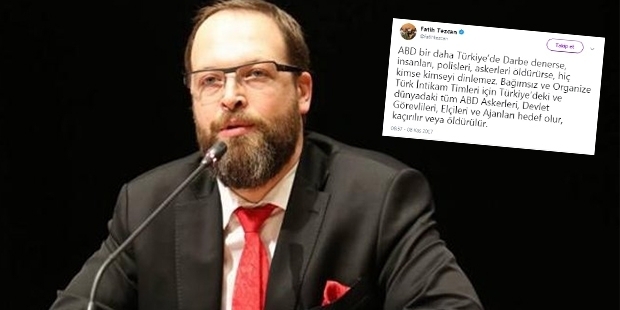 The US soldiers and diplomats in Turkey and elsewhere will be executed by “revenge teams” in case of a second coup attempt in the country, pro-government journalist Fatih Tezcan tweeted Wednesday. “If the US attempts to carry out a military coup in Turkey one more time and kills people, police and military officers, nobody will listen to any advice. All the US soldiers, statesmen, foreign delegates and spies may become target for the Independent and Organized Turkish Revenge Teams, they may be abducted and killed,” Tezcan wrote. Turkey survived a military coup attempt on July 15, 2016 and conspiracy theories over who really masterminded the failed takeover include Washington’s alleged involvement as well. Tezcan’s tweet which was later deleted came the same with the PM Binali Yildrim’s official visit to US.